Adults may only think of St. Patrick’s Day as a free pass to enjoy all the adult beverages they want, but it can actually be a great day for kids and families as well. If you’re taking time off or leaving work early to celebrate, there are lots of activities you can do as a family today! If you’re lucky enough to live in Chicago, Denver, Savannah, Boston, New York City, Seattle or any other big city, you can head to the big St. Patrick’s Day parade. No matter where you are, you can likely find a parade near you with this St. Patrick’s Day parade locator. St. Patrick’s Day is actually celebrated more by Irish-Americans than by people in Ireland, but it’s still a good opportunity for a lesson in Irish history if your kids are curious. St. Patrick’s Day started in honor of Saint Patrick, the patron saint of Ireland. In addition to being an important figure for Irish Catholics, Patrick is also the reason you see shamrocks everywhere on St. Patrick’s Day. 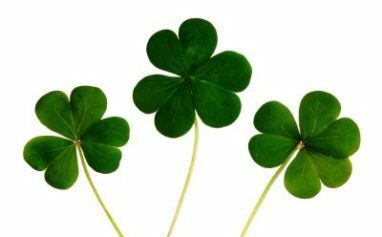 While traveling across Ireland, Patrick used shamrocks, which have three leaves, to illustrate the Catholic Holy Trinity to those he met. In Ireland, St. Patrick’s is traditionally a more somber occasion that celebrates the country’s patron saint. However, the local government began promoting more festive celebrations in recent years due to the amount of tourism St. Patrick’s Day brings in. Whether or not you like shamrocks for their history, they’re still a fun and festive thing to decorate with today. Kids might enjoy cutting shamrocks out of construction paper or making paper leprechaun hats. Another fun craft might be making a paper rainbow leading to a pot of gold. The possibilities are endless for dying food a festive green color. If you plan to make a dessert today, why not try green cake, grasshopper pie, green Jell-O, cupcakes with green frosting, or shamrock-shaped sugar cookies made with green food coloring. For healthier options, any green vegetable can be presented in a festive way. Try arranging sliced cucumbers in a clover shape, making spinach dip, or topping a pizza with broccoli and other vegetables. It might also be fun to try a traditional Irish meal such as shepherd’s pie, boxty (a homemade hash brown), bangers & mash (potatoes with sausages), or an Irish beef stew. St. Patrick’s Day is all about being green. Whether you’re enjoying a green beer, green-dyed food, or are wearing green to avoid getting pinched, the color is everywhere. However, there’s another way to be green today that you might not have considered. Donating your car is a great way to get rid of a vehicle in a responsible way. When you donate your vehicle to Wheels For Wishes, it will be recycled and used to make new vehicles, or auctioned off for a new owner to use. Either way, the proceeds from its sale will benefit children’s charities in your area. If you’d like to donate your car, truck, boat, RV or motorcycle, please call 1-877-431-9474 or donate your vehicle online.